Enjoy full A3 printing, copying, scanning and faxing. Ideal for high volume printing as users benefit from low running cost with affordable 2,400* page yield InkBenefit cartridges. Increase productivity with high print speed and auto-duplex printing. *Refers to black ink. Colour ink: 1,200 page-yield. Declared in accordance with ISO/IEC 24711. Stunning photography, detailed spreadsheets, precise blueprints and inspiring designs all come to life in A3 format. 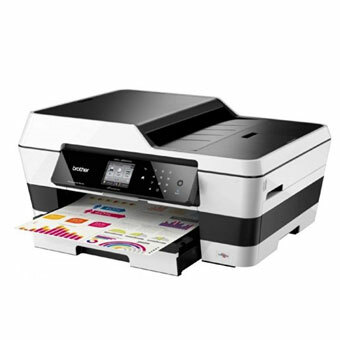 Full A3 high print volume printing, copying, scanning and faxing in one innovative machine. Save on running cost with affordable 2400^ page-yield InkBenefit cartridges which last longer and allow users to effectively reduce total operating costs. Moreover, users reduce paper and ink wastage with Brother’s duplex (two-sided) printing. Plus, easily produce 2-up and 4-up on a single sheet. This saves paper when viewing drafts or layouts. ^ Refers to black ink. Colour ink: 1,200 page-yield. Declared in accordance with ISO/IEC 24711. Beat the deadlines with the fastest print speed in its class+ of up to 22/20ppm*. Time is saved when there are multiple users or large volume printing tasks. + As of September 2013. * ISO/IEC 24734. Click here to find out more about Brother print speed. The Automatic Document Feeder (ADF) allows unattended scanning, copying and faxing of multi-page documents quickly and easily, complementing our MFC’s stack and sort capabilities for added convenience. The PC Fax receiving function boasts a junk fax filter that eliminates the printing of unnecessary faxes by scanning documents directly to your computer instead of printing them out indiscruminately, thereby cutting down on paper and ink wastage. The direct print feature enables users to print files such as JPEG or printer-ready documents without even using your computer! Print directly from a USB flash memory drive, media cards or PictBridgeTM compatible digital cameras by simply connecting them to the MFC. Brother’s Apps: an ever-evolving range of applications that adds greater flexibility, productivity and efficiency to the way you work. With the free iPrint&Scan app, you can now print directly from your iPhone, iPod Touch or iPad. Plus, you can scan documents from your MFC straight to your Apple gadgets. Click here to find out more about Brother print speed. *Automatic 2-sided printing requires 3mm top/bottom/left/right minimum default margins. Measured when the machine is connected to the USB interface. Power consumption varies slightly depending on the usage environment or part wear.